Has Nigeria acquired Super Hinds? IHS Jane’s Defence Weekly claimed in a report on Wednesday that Nigeria had reportedly taken delivery of two Mi-24 ‘Super Hind’ helicopters from Ukraine. This now appears to be incorrect. The Super Hind is a comprehensive upgrade package for older Mi-24s, created by Advanced Technologies and Engineering (ATE) of South Africa. The company is now part of the Paramount Group as their Advanced Technologies division. The Jane’s report was based on a photograph posted by a Nigerian blogger who goes by the name of ‘Beegeagle’. It shows two Super Hinds in a two-tone desert camouflage, which he claimed were destined for the Nigerian Air Force. No national markings are visible. Subsequently, a Livejournal blog run by Russia’s AST Centre elaborated on Beegeagle’s post, by linking the posted photograph to two screen caps from a 16 October Ukrainian news broadcast showing two Super Hinds in the same colour scheme on the floor of the state-owned Konotop Aircraft Repair Plant, commonly referred to as ‘Aviakon’, in Ukraine. The post asserted that Aviakon was upgrading Mi-24s to Super Hind status for Nigeria, based on the similarity of the colour scheme to the aircraft in the photo that Beegeagle posted. Rather than being Nigerian, multiple sources have told African Defence Review that the Super Hind helicopters in both photos belong to the Algerian Air Force, which has been sending a pair of Super Hinds at a time to Aviakon to be refurbished and upgraded under a contract signed in 2013. Algeria upgraded 34 Mi-24s to the Super Hind MkIII standard in the early 2000s. In addition, a Paramount Group spokesperson confirmed to us that Paramount Advanced Technologies was not contracted by the Nigerian government for any Mi-24 upgrades. 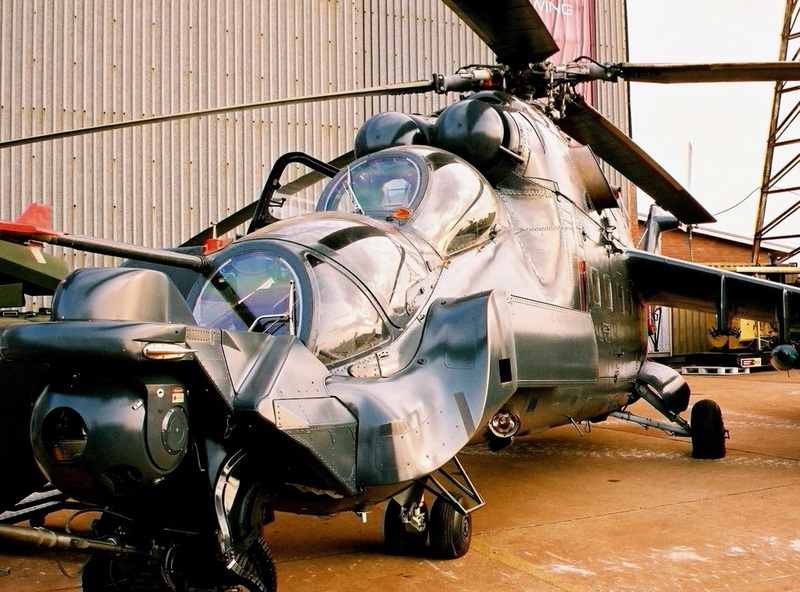 a Paramount Group spokesperson confirmed to us that Paramount Advanced Technologies was not contracted by the Nigerian government for any Mi-24 upgrades. The fact that the aircraft are Algerian has also been confirmed by Akram Kharief, an Algerian defence analyst with close contact to the Algerian Air Force. It is also in line with the appearance of the Super Hinds in the photos, which are fitted with the now-discontinued Argos 550 sensor turret and not with one of the newer, cheaper and smaller equivalents that have emerged over the past few years like the Argos II HDT (the 550’s successor) and the IPZ TITAN 410 SD. The two-tone desert colour scheme is also a fairly close match to the paint scheme the Algerian Air Force adopted for its helicopters when operations against al-Qaeda-linked Islamist militants moved to the country’s south. Aviakon has a lot of experience with the Super Hind, as it performed the upgrade of Azerbaijani Mi-24s to Super Hind MkIV status, designated by the Azeri military as the Mi-24G (‘Gele’ meaning night). So with ATE’s well-publicised financial troubles before its rescue by Paramount it made sense for the Algerian Air Force to approach Aviakon instead. Jane’s speculated that Nigeria would be obtaining the IPZ NP-B laser designator, but a news item from IPZ themselves make it clear that their first Mi-24 upgrade with the NP-B, and potentially the TITAN 410 SD, is Algeria. Update: After this story was published, IHS Jane’s removed their article and uploaded an amended version which no longer claims that Nigeria has received Super Hinds. As a result, the IHS Jane’s link in the first paragraph now presents a 404 error.